Designed specifically for BMW F87 M2 and M2 Competition Pack. An Eibach Pro-Kit Lowering Spring Kit is a superb balance of looks, performance, and ride quality. Either on it's own or paired with sports dampers/anti-roll bar upgrades it's a terrific solution for tuning the suspension on a road car. 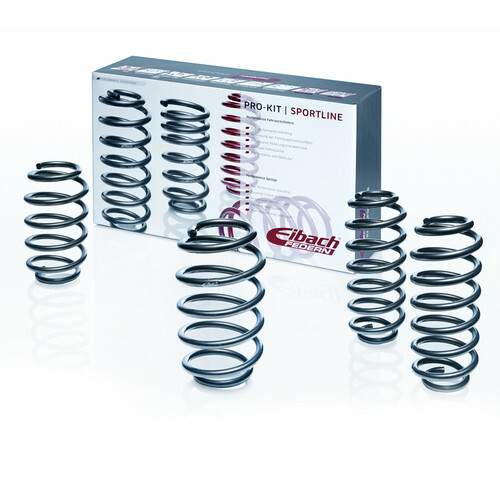 While the kit itself is top quality the real value comes from Eibach's expert spring tuning. This kit will tame excessive body-roll, squat, and dive - but still retain near OE levels of comfort. No mean feat. Eibach Pro-Kit Lowering springs drop most cars about 30mm (less on cars already lowered from factory). This mild lowering amount allows Eibach to make big, noticable improvements to handling with all of the benefits you'd expect from a lowered sports suspension whilst still offering enough suspension travel for OE or near-OE ride quality. It also means this kit just fits straight onto most cars with no other upgrades required. Dropping a car lowers it's centre of gravity. This makes it less prone to roll which means it keeps more weight on the wheels on both sides through a corner. This makes for better grip. Eibach also carefully tune spring rates to improve handling. The improvements tend to be immediately noticable, but unlike some lowering springs on the market, they tend not to come at the expense of ride comfort. Lowering springs are good on their own, but they get even better when paired with other upgrades. Uprated sports dampers are a good companion upgrade. The lower stiffer springs work extremely well with a firmer shock absorber. The bouncier rebound on the stiffer springs is tamed by the firmer sports damper for an all-round better ride. We also recommend uprated anti-roll bars. These work right along-side the springs in controlling body roll through corners and can help you tune out undesirable handling characteristics like safety understeer. Your car will also look better lowered. A lower car will have smaller arch-gaps, meaning that your wheels will better fill the arches. This is usually what you want, especially if you've upgraded the wheels. Eibach use a mixture of linear and progressive rate springs, depending on what their engineers find works best on the vehicle. Eibach lowering springs are fully TUV certified to work with the original dampers, although they will work better with a sports damper. As these are stiffer uprated sports springs, they will make worn dampers more noticeable so we'd recommend replacing old/worn dampers at the same time as fitting. We'd also recommend a wheel alignment. On some vehicles the kit will not consist of four springs. This is usually where the design of the suspension at one end does not allow the easy fitting of coil springs. This includes cars with torsion bar suspension, or cars with air-springs. The notes and subtitle of the specific kit should explain this. In some cases you may need to modify the lowering of these components to match the lowered coil springs.